Justin Bieber has be a newsworthy subject for a good year having been involved in a drug, super car, egging and limousine scandal! He was due in court to plead his innocence for an assault against a limo driver yesterday but did not show, disappointing the fans that awaited his arrival. The figure of a limo driver is one synonymous with safety, making it their job to protect their passengers, especially when chauffeuring famous figures. It seems that Justin and his entourage took this for granted, harming their limo chauffeur in a violent manner. Defence lawyer Brian Greenspan, who appeared on the singer’s behalf in an Old City Hall courtroom yesterday, said he has “independent witnesses” who can validate his actions on that day, proving that he did not assault the limo driver. “We will pursue our independent witnesses, we will compare them to the witnesses that will be provided to us in disclosure, and decisions will be made,” he said outside court. He was charged with assault back in January with his next court appearance dated for mid April. Outside court a gang of Beliebers celebrated their love and support for the Canadian, with one screaming, “tell Justin I love him” as Greenspan stood outside the courthouse. Karen Phillips, 43, from Port Perry, said she was glad she brought her 14-year-old daughter even though Justin did not make an appearance. “We had planned to come regardless if he was here or not,” she said. Bieber’s music has helped Natalie deal with health problems, including a broken back and juvenile osteoporosis, she claimed. “Yes, he maybe has done some things that he shouldn’t have done but he is growing up and hopefully learning from his mistakes and I’m just supporting her and trying to help her cope with her things that she’s had to deal with,” Karen Phillips said. Roxy Hryshyk, 15, encouraged people to “just back off” Bieber. “He should learn from his mistakes, but at the same time he’s young still and there’s a lot of pressure on him right now,” she said. 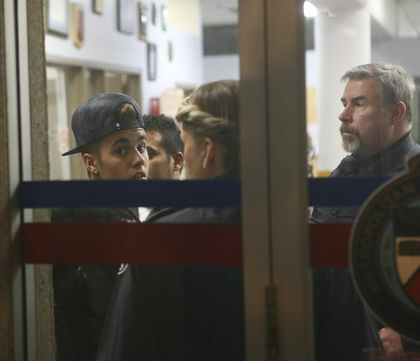 Bieber also faces legal troubles in the United States for egging a property and driving under the influence.